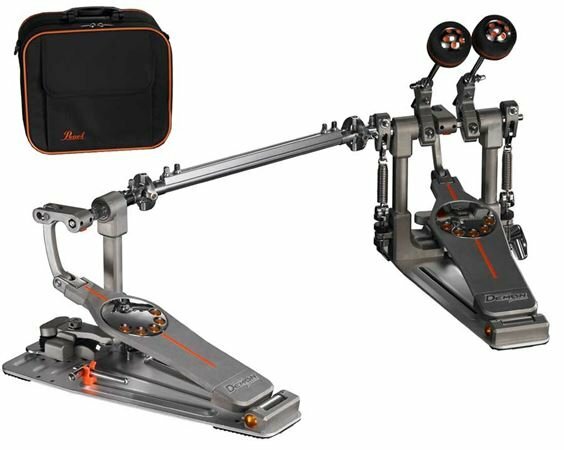 Shop Pearl P3002D Eliminator Demon Drive Double Bass Pedal With Case from AMS with 0% Interest Payment Plans and Free Shipping. The fastest, smoothest, most versatile pedal in the world. The Eliminator Demon drive double bass pedal bridge the gap between control and versatility. Engineered and designed by Pearl to create a seamless link between your musical ideas and their execution on the bass drum. Eliminator Demon Drive offers the maximum adjustability for your playing style whether you are during lightning fast blast beats or deep rock solid grooves. Additional features of this amazing pedal include the world’s first two-position Beater Stroke Adjustment and two-position Direct Link Adjustment. Both adjustable features allow the player to create a slightly lighter or heavier feel of the pedal depending on their preferred setting. Adjusting the Duo-Deck in combination with the Beater Holder and Direct Link Adjustments yields 8 possible Pedal Configurations, allowing the player to truly create their ideal pedal configuration. Best pedal I’ve ever had! The Pearl Demon Drive has been such a pivotal piece to my puzzle since purchasing it last year! My playing has never sounded or felt better, as well as my confidence in my foot work has progressed immensely! The direct drive was a change for sure compared to the chain drive. But, as a drummer it is exciting to expand the horizons and try new things!! I most certainly chose wisely! What a sweet piece of engineering! I started with a Ludwig Speed King years ago and flat wore it out. After that I went to a Pearl Eliminator double pedal chain drive, but def missed the direct drive. Right out of the box I could tell the Demon Drive is a fine piece of hardware and I cannot wait to put lots of hours on it. I have no doubt this pedal will prove to be the best investment in drum equipment I have ever purchased. This pedal is beautiful , it's feel and smooth operation. absolutely no noise or squeaking. Engineered and built like a pedal should be . Best pedal I've ever owned . I have been through a couple different double bass pedals trying to find the perfect one, and I think I’ve finally found it. I love the amount of variety this pedal contains in ways of tuning it to your preference. The direct drive is amazing as it’s super responsive in every bit of the term. I highly recommend this pedal to anyone. Product is obviously well made and has a ton of options for adjustment, but they are not for me. If you are a primarily chain-driven pedal user these might not be your fit either. I spent an hour adjusting and getting the pedals to where I found comfortable, and they play good but compared to my chain driven they play extremely soft. I even put plastic beaters instead of felt and it's almost hard for me to hear/feel the bass when in playing with headphones. Good product, but would take ALOT of getting used to if your not used to direct drive pedals. This product is not worth the money do not buy trust me! The pedel does not even work with some of the adjustment's.don't no how this pedel is even on the market.slave pedel feels better than the main pedel, go figure.all the professional drummers endorsed by pearl use the old eliminator not the demon drive.why because it is garbage! Footboard adjustment...long or short on same pedal, GENIUS! Best Pedal on The Market Today!!! Top notch. There's even rubber feet to prevent the clamp from scratching your bass drum's hoop. It's performance is consistent and quiet. I think this pedal is over-priced. I played this in the store and fell in love with it but wouldn't let myself pay more than $400 for a high end double kick pedal because I couldn't justify the extra expense. I eventually found a double Demon Drive used for under $400 and picked it up. I'm very happy with it, but it's not a great value. This is more for the discerning player (which I am not, I'm just spoiled).